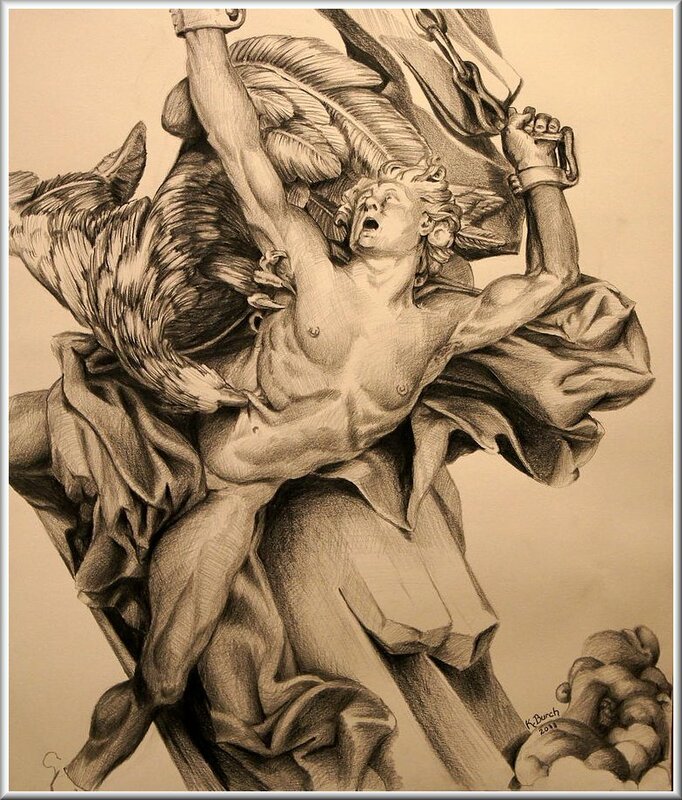 As if that wasn't bad enough, each day an enormous eagle (some say a vulture), sent by Zeus, would arrive and eat at Prometheus' liver, feasting on the helpless Titan. Unrepentant for his actions, and fully aware that he had done the right thing in stealing fire from Olympus and giving it to Man, Prometheus was resigned to eternal life on the rocks, so to speak. As if that wasn't bad enough, each day an enormous eagle (some say a vulture), sent by Zeus, would arrive and eat at Prometheus' liver, feasting on the helpless Titan. To make matters worse, the liver would grow back overnight and the whole ordeal would be repeated the following day. Talk about cruel and unusual punishment! For thirty years (some say one thousand, or even thirty thousand years) Prometheus endured this excruciating pain and torment. Being a god he couldn't die, hence his ordeal could not be eased. 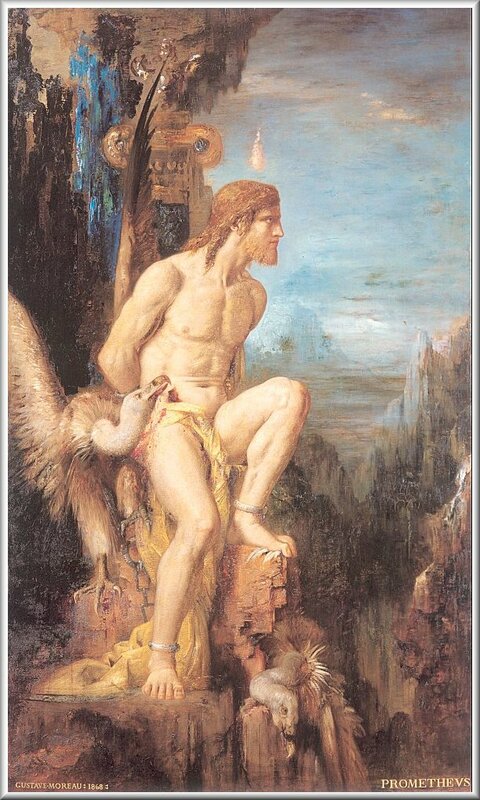 At one point Zeus offered him a chance to free himself by revealing information that Prometheus knew. Since our hero had the power of Foresight, he knew the name of the one who would overthrow Zeus, just like Zeus had done to Cronus. The King of the Olympians promised Prometheus that he would set him free if only the Titan revealed the identity of his potential usurper. Nothing doing. 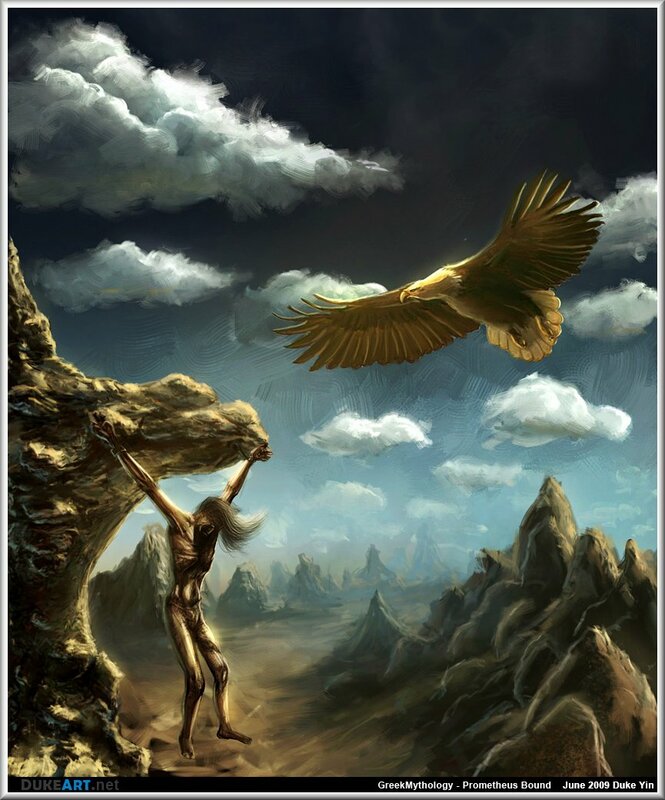 Stubborn Prometheus informed the Messenger god Hermes, who had delivered Zeus' offer, to tell his boss to go fly a kite. He couldn't be bribed. "Go and persuade the sea wave not to break. You will persuade me no more easily." "There is no force which can compel my speech. None of this will bend my will." Small consolation, thought Prometheus...What Immortal would ever give up his life for a Titan, he mused, and besides, there was no mortal brave and strong enough to kill the evil beast that feasted on his liver. But wait! Our story has a happy ending. 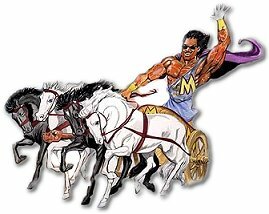 You see, the Centaur (half man, half horse) named Chiron, a wise and Immortal mentor of many Greek heroes, had been accidentally shot and wounded by one of Heracles' (Hercules) poisoned arrows. The arrows were deadly, having being dipped in the blood of the dying Hydra. But being an Immortal, the gentle Centaur could not die, but lived in horrid pain from the lethal poison. 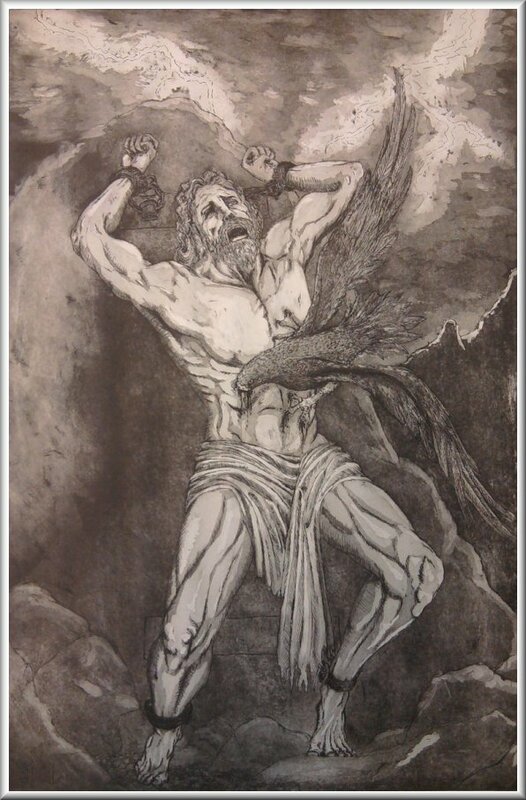 Hearing of the plight of courageous Prometheus, Chiron volunteered to die in his stead so that his unbearable pain would cease, at the same time conferring his immortality upon the chained Titan. It was a mutually beneficial move and fulfilled the first part of Zeus' terms. Now, where could be found a mortal hero brave enough to challenge the ferocious eagle? Have no fear, Heracles is here! Passing by Mount Caucasus one day the world's greatest hero, mighty Heracles, saw Prometheus bound to the rock, with the frightful eagle merrily munching on his liver. This would not do! Heracles was famous for always taking the side of the just, the powerless and the overwhelmed. Armed with his bow and arrows, gifts from the gods, mighty Heracles took aim and let fly a missile at the beast. Bingo! One shot was all it took and the Titan's tormentor became buzzard feed itself, killed instantly by the poisoned arrow. Prometheus was now free to go! 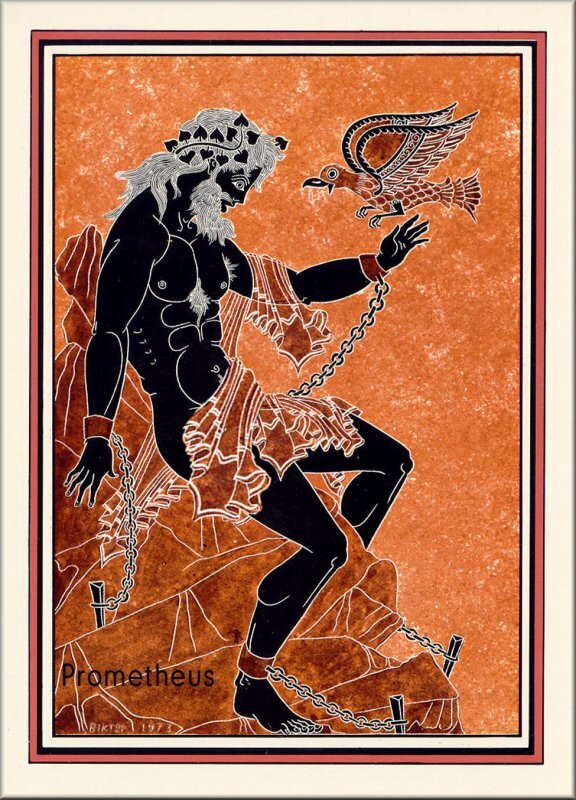 By this time Zeus had realized his folly in imposing such a stern sentence upon the brave Titan, so he invited Prometheus to come and live on Mount Olympus. All was forgiven and our hero rejoined his rightful place at the home of the gods. 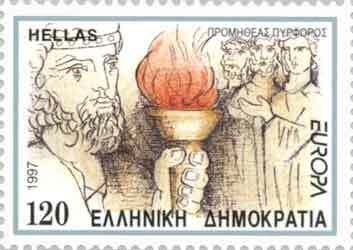 Zeus did make Prometheus wear a ring, in which a piece of the Caucasus rock was set, as a symbol of his painful connection with the mountain. This represented the first ring to have a setting, and ever since humans have worn rings in honor of the Titan, in gratitude for all the agony he had endured on their behalf. "No hard feelings. By the way, Prometheus, any chance of you telling me the name of the one who will overthrow me?" asked Zeus. 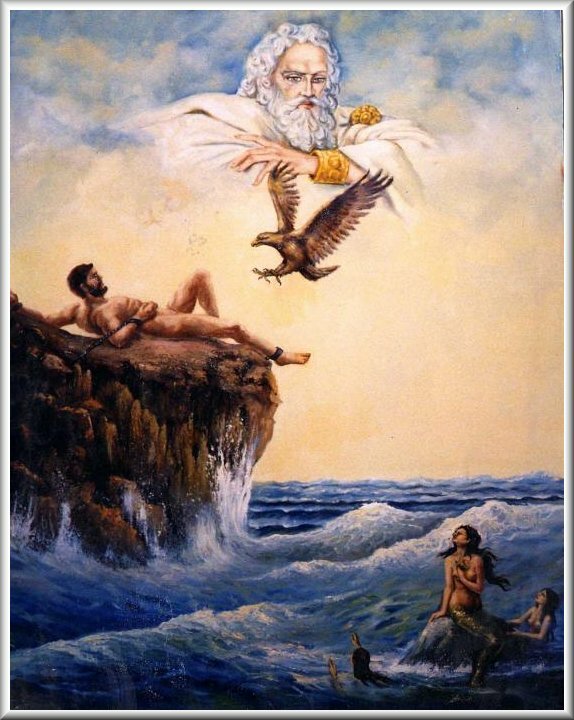 But just to show that he harbored no grudge, Prometheus eventually did tell Zeus and Poseidon, who were both pursuing a sea nymph named Thetis, to avoid the girl at all costs. Prometheus informed the Olympian gods that the son of Thetis would grow up to become mightier than his father. A thankful Zeus promptly ordered Thetis to marry a mortal named Peleus and their offspring was the great hero of the Trojan War, Achilles, who indeed achieved a fame far surpassing that of his father. Before his divine punishment Prometheus married Hesione, and is said to have conceived Oceanus with her. He is also considered to have been the father of Deucalion and in some cases is described as the brother of the Titans Atlas and Menoetius, as well as the foolish Epimetheus. The name of brave Prometheus has endured throughout the ages as the world's first rebel and the champion of humanity. He fought against divine authority for his ideals and ultimately paid a heavy price for his Foresight. Aren't you glad he did, though? See what I, a god, endure from the gods." LOTS MORE INFO AND PIX! To make matters worse, the liver would grow back overnight and the whole ordeal would be repeated the following day. Talk about cruel and unusual punishment! Chiron volunteered to die in his stead so that his unbearable pain would cease, at the same time conferring his immortality upon the chained Titan. Armed with his bow and arrows, gifts from the gods, mighty Heracles took aim and let fly a missile at the beast. Bingo! One shot was all it took. The name of brave Prometheus has endured throughout the ages as the world's first rebel and the champion of humanity.